Well, they say a picture is worth a thousand words so I thought I would try to add some this week. 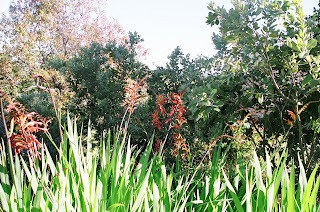 These are pictures of Rosemary, Manzanita, and Chasmanthe blooming on the bank while much of the rest of the garden is taking a break. 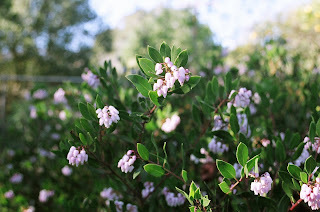 I am always very interested in plants that bloom in late fall and winter. Ever year I vow to add more. The weather has been beautiful . I wonder if it signals an early spring or Mother Nature has surprises in store. At any rate, enjoy it. Thank goodness for the break in the rain. I was beginning to wonder if I was ever going to have chance to do my pruning. Although I am very thankful for the much needed long, slow soil soaking moisture, I needed to get my roses pruned before Superbowl Sunday. January tends to be our coolest month. A slight temperature increase in February along with the ever so slightly increasing day length can cause growth spurts that can catch you by surprise. So don’t put it off too much longer. So out into the garden I went. First I spent a few moments to a little much needed sun and listen to the birds. I must have seen at least ten different types. They were happy to be out in the sun too. O.K. quit stalling, time to get to work. Luckily my husband Joel helps me. It makes the job go so much faster. We were able to do about thirty rose bushes before the sun started to go behind the trees and it began to get cold. When the sun goes down, I go in. The roses were done and ready for dormant spraying. Tomorrow if it doesn’t rain I will try to get to it. Don’t forget: if it does rain within two days after spraying, you should re-spray again. P.S. Next time you are in the nursery let us know that you read our blog and if there is anything you would like to hear about or have us discuss. It’s raining, it’s pouring… It’s wet and it’s cold. It’s great to get some rain though. Today I wanted to remind everyone about the dangers of tramping around on and working with wet soil. We are all anxious to get back in the garden. Resist the urge. Working wet soil (especially clay soil) compacts it and ruins structure for a long time. The earth is very saturated and we need to give it a break. I am especially frustrated because I still need to finish spraying my roses and I haven’t even started on my fruit trees yet. Which reminds me, if you dormant sprayed right before the rain you will have do it again. I am going to use this time as an opportunity to organize my garage and garden shed. Maybe I will sharpen and clean my tools. I also need to go through my garden products and see what I should eliminate and what I should purchase. For a reward I can redo my patio containers on the veranda. We do have a lot of beautiful color in stock. Of course sitting in front of the fire with a book is another alternative. It’s pretty quiet at the nursery during the rain. We use the time to clean, redo and organize. Last weekend we held our Fruit Tree and Rose Clinics. It was a full house for both days. Everyone had lots of good questions and we all learned new things. If you missed our classes, you have a second chance this weekend. Saturday will be Roses and Sunday will be all about the Fruit Trees. With the sunny weather we are having, it sure feels like spring, but don’t forget that we are still in January and it can get cold very fast again. There is still plenty of time to plant annual color and winter veggies. And we just got a fresh supply in. Put them in now and you should have great color and good eats till June. The bare root roses are going fast, so come on in so you won’t miss out on the ones you want. If you are not sure, we’ll be glad to help you narrow down your choices. Our goal is to help you have a beautiful and successful garden, to find enjoyment and satisfaction in your accomplishments as we journey through this years gardening experience together. Welcome to the La Sumida Blog. This is a new venue for us, so let us start by introducing ourselves. My name is Judi Smith. I am A Santa Barbara Native and have been with La Sumida for over 21 years. I lived in North Idaho for ten years where I learned do “extreme” gardening, with short seasons and no water. I received my horticulture degree at Spokane Community College, but in my opinion the best education came from trading information with our growers, gardeners and customers at La Sumida Nursery. My areas of special interest are garden color, perennials, cottage gardens, containers, and vegetable gardening. My name is D. Honer. I am not quite a Goleta Native; my parents bought their property here when I was 18 months old. I have been at La Sumida for ten years. I studied Environmental Horticulture at SBCC after a career in retail management. My areas of special interest are edible landscaping, Mediterranean and drought tolerant, trees, and California native plants. I love working at La Sumida. I get to work with plants and learn something new every day. We will be sharing blog space. Check back soon. we look forward to your input. 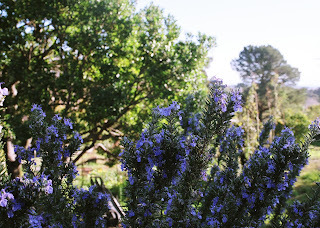 Welcome to the La Sumida Nursery blog! Welcome to the first blog of the new La Sumida website. We are almost ready to go live and are getting very excited. This website is a work in progress, an outline of more to come. In future months we will refine and add additional content. Feel free to let us know what information and features you would like to see. Check back soon. Judi and I will be learning to “blog” and let you know what’s up at La Sumida Nursery.